All of this time I’ve been jealous of you! So let’s speak to her see, I want a swap too!! ‘Excuse me if I sit on you,’ the cup said to the saucer. ’Oh, I’ll stir him up directly,’ said the spoon. ’Ah, you’ve taken too much tannin,’ jeered the jug. Well… that’s certainly a good selection to get you going! 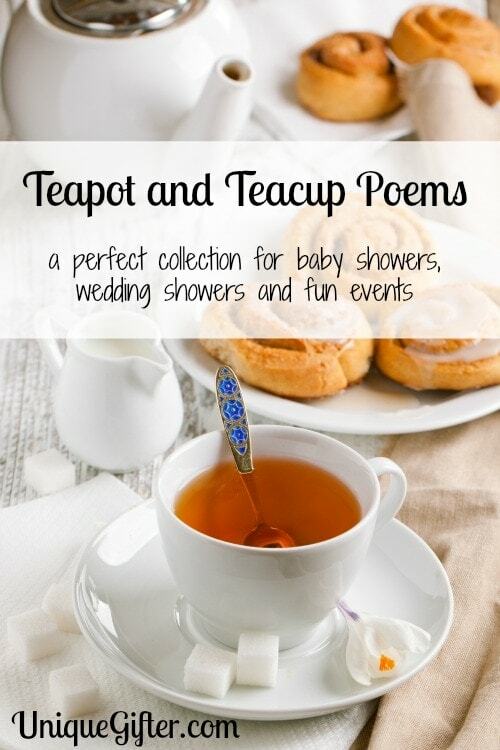 Poems are a fantastic, affordable way to add a nice personalized touch to a wedding gift. Do you know of any good ones for tea? While medals would be correct, the author's original is meddles.